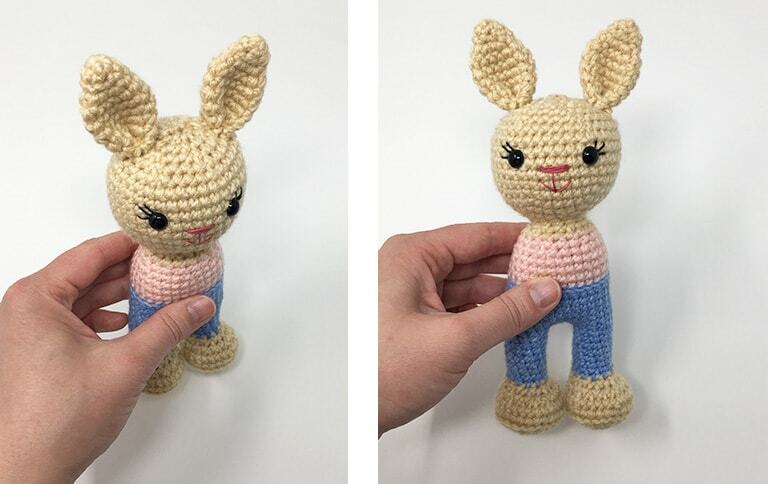 Welcome to Part 2 of our Mini Berry Patch Bunny CAL! I love all of the colors I'm seeing in the group and now it's time to add our final features. These two have me thinking of Spring and flowers blooming with bright and bold colors! While we're coming in close to Easter I love bunnies year round and plan to make some more (my girls have claimed these) to put on my desk! Today we will make the ears, arms and straps! One of my favorite parts about this pattern is that the ears and arms are the only portion we need to sew. I have some tips below on my favorite ways to attach them on, plus a video tutorial! Most of my ears and arms are either sewn closed or I use a few single crochets across the top to close them. I like this method as it ensures it is closed and no stuffing will come out if a stitch is missed when sewing. I also like that it provides a stitch or portion to sew through for quick and easy assembly! 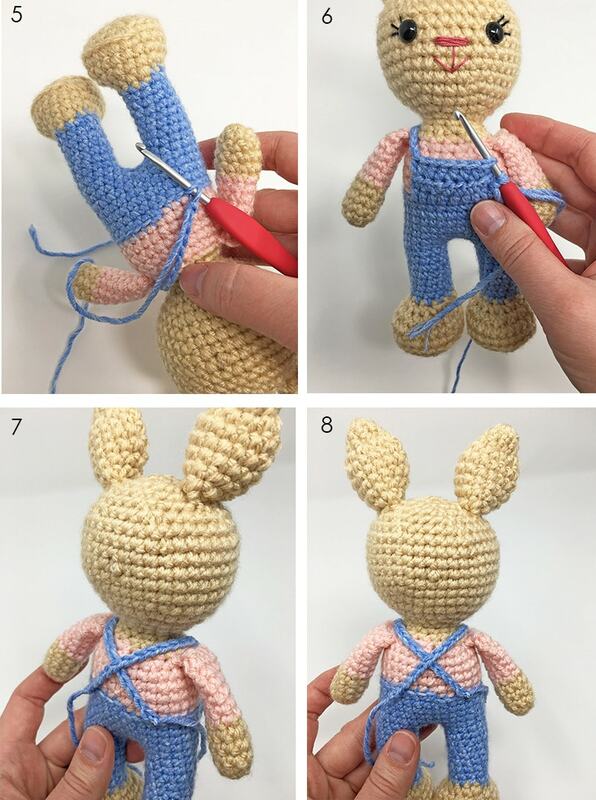 The bib and straps are made right on the bunny and no sewing will be needed, just a few weaving of ends. Remember our round of using the back loops only in Part 1? We will be using a few of the front loops that are remaining to make our bib! If you are just joining in or learning about the CAL it's not too late to start! You can find all of the details about the CAL and link to Part 1 here! Each part will remain free here on the blog so you can crochet at your own pace. PIN Part 2 to your crochet board here! If you'd like to be notified by email for this CAL plus stay updated when new patterns are released you can sign up for my newsletter here! Working in a magic circle make 5 DCs, slip stitch, 5 DCs, and slip stitch again, pull your string tight and wrap it around the middle of the bow 4 times. Tie/secure in the back and cut your string leaving a long section to sew with. - First, sew the ears onto the head starting at the 4th round and ending around the 6th round. My favorite way to sew on ears is to use a pin to hold them in place and then passing my needle through a stitch on the head I'll go through the bottom portion of my ear. Once through I'll pick up another stitch on the head to pass through and pull tight. Continue this process until you feel your ears are on and secure. Give them a gentle pull to see if there are any places that were missed or could use another pass through. For extra strength feel free to go around a 2nd time! - Next, sew the arms on the body centered with the head at round 29. I like to use the whip stitch for my arms. 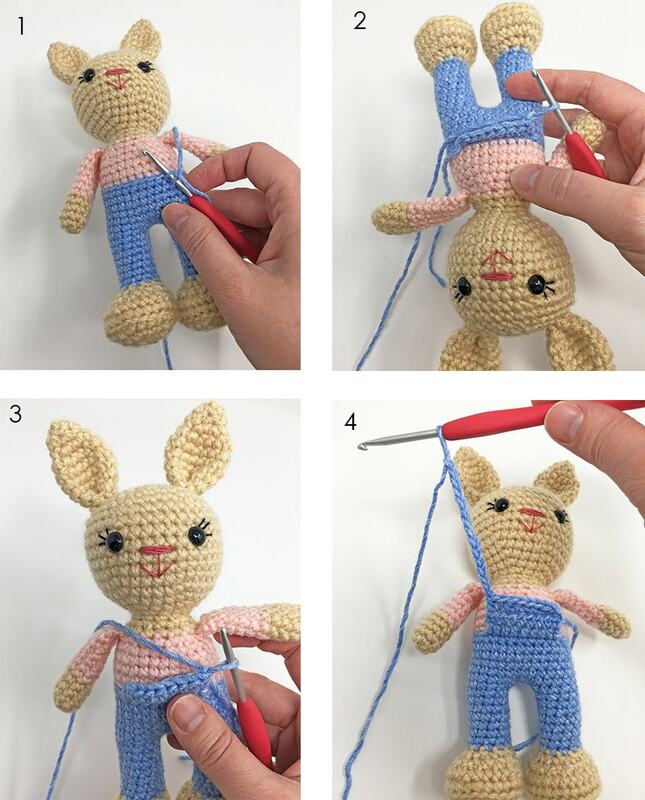 Once you have them pinned or placed where you would like, insert your needle into a stitch on your bunny (aiming for the last row of your shirt color) and then into the first top stitch on your arm. Continue this process until your arm is completely attached, again feel free to go back through a 2nd time for extra strength. - Lastly, for the girl version sew the bow onto the desired ear. To make this last part we will be attaching and crocheting along some of the front loops from round 24. No sewing will be needed for this portion. 1. With overall color make a slip knot and attach with a slip stitch to one of the front loops from round 24. We will be using the center 8 stitches for our bib portion. I used the mouth to help me find the center and counted out a few stitches on each side to find my 8 middle stitches. 4. HDC across (8) Once you complete this row, do not fasten off. Make a chain long enough to reach across the back to the opposite side (the straps will make an ‘x’ when complete) and slip stitch into a front loop from round 24. Our tension may be different, and the amount of chains needed to reach the other side may differ, for reference I chained 17. Fasten off and weave in your end. 5. Create a slip knot and attach with a slip stitch to the other (front) side of your bib. Make a chain with the same amount as the first and attach with a slip stitch to the back as before. Fasten off and weave in your ends. 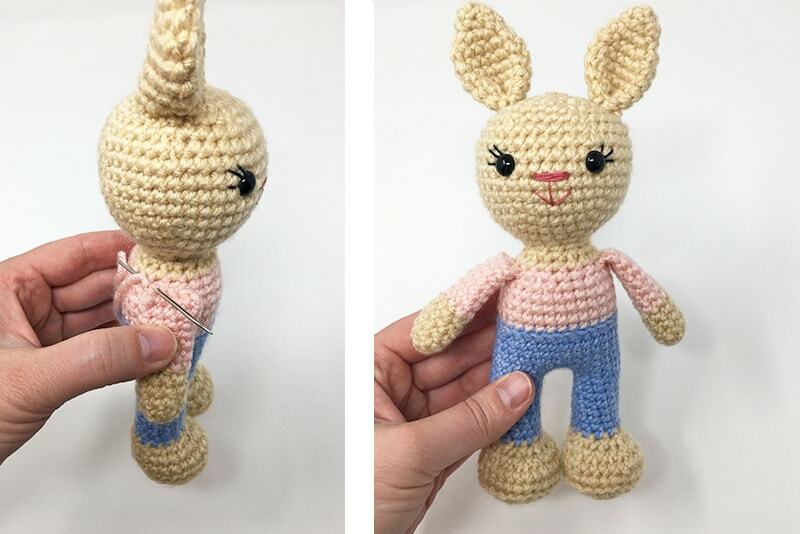 You're Mini Berry Patch Bunny is done! I hope you have enjoyed this pattern and I want to thank you for making this and each CAL so much fun! Feel free to share your bunny with us in our Facebook group here, we would love to see them! 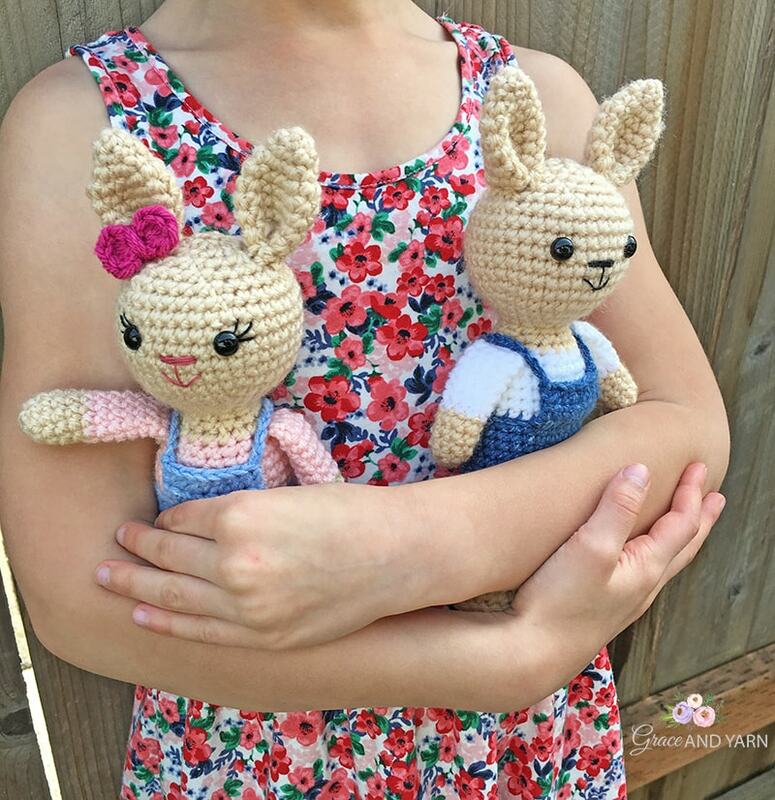 If you're enjoying how quick and fast these smaller patterns come together check out this roundup of free mini amigurumi patterns!